Projections of the severity of anthropogenic climate change are strongly dependent on our estimates of climate sensitivity, traditionally defined as the average warming at the Earth’s surface due to a doubling of the carbon dioxide from pre-industrial levels. This importance arises not simply because the mean temperature change directly causes all of the impacts of major concern, but because many other effects of climate change are predicted to increase in severity with larger warming. Equilibrium sensitivities in global climate models typically range from 2 to more than 4C, while the transient climate responses are smaller, in range of 1.0-2.5C. Estimates of equilibrium and transient climate sensitivity from our recent CMIP5 models are described by Delworth et al 2012, Griffies et al 2012, and Winton et al, Jan 2013. The CM3 model, which attempts to simulate the interaction between aerosols and clouds, has higher equilibrium and transient sensitivities than other GFDL models. Recent fundamental insights on the factors that control the difference between equilibrium and transient sensitivities have resulted from a series of studies by GFDL scientists, following on Michael Winton’s introduction of the concept of the “efficacy of ocean heat uptake”. See Winton et al, 2010, Held et al 2010, Winton et al April 2013, Rugenstein et al, 2013. This concept is illustrated in the Figure. The co-evolution of the global mean surface air temperature (T) and the net energy flux at the top of the atmosphere, in simulations of the response to a doubling of CO2 with GFDL’s CM2.1 model. Slightly modified from Winton et al (2010). A recent analysis, co-authored by GFDL scientists, explains why the progress on reducing uncertainty on climate sensitivity has been slow since the prescient Charney Report more than thirty years ago (Bony et al 2013). A new perspective on water vapor feedback, a key contributor to all estimates of climate sensitivity, was recently provided by Held and Shell, 2012. But cloud feedbacks remain the major uncertainty among the feedbacks that control sensitivity. A recent analysis of cloud feedbacks in a GFDL model, and an illustration of how one can modify the strength of this feedback, has been provided by Zhao (2014). Uncertainty in the impacts of human emissions on the cooling of the planet by particles suspended in the atmosphere (aerosols) is the main factor limiting our ability to use the observed warming over the past century to constrain transient climate sensitivity. This important topic has been the subject of several recent studies by GFDL scientists, from a number of different perspectives (Levy et al 2013, Zhang et al 2013, Rosenfeld et al 2013, Golaz, Horowitz, and Levy, 2011, Golaz et al, 2013). Other aerosol research, much of it motivated by this problem of constraining climate sensitivity, can be found here. Many of the fundamental results concerning climate sensitivity, equilibrium and transient, were first examined at GFDL by Syukoro (Suki) Manabe and his colleagues. We are happy to note that Suki continues his research on this topic, searching for empirical constraints on the feedbacks that underlie all estimates of these quantities. 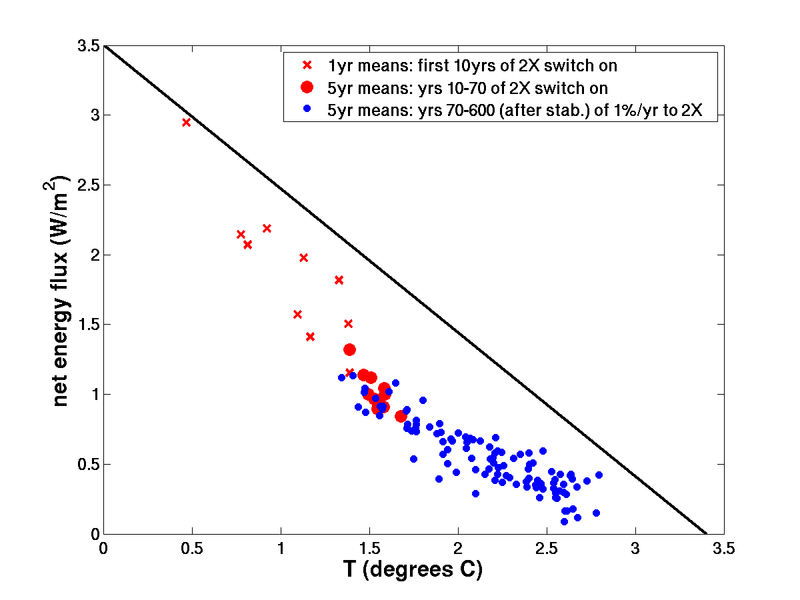 A variety of issues related to climate sensitivity are discussed on Isaac Held’s Blog. Zhao, Ming, in press: An investigation of the connections between convection, clouds and climate sensitivity in a Global Climate Model. Journal of Climate. DOI:10.1175/JCLI-D-13-00145.1. 11/13. Held, Isaac M., September 2013: Climate science: The cause of the pause. Nature, 501(7467), DOI:10.1038/501318a. Rosenfeld, D, R Wood, Leo J Donner, and S C Sherwood, August 2013: Aerosol Cloud-Mediated Radiative Forcing: Highly Uncertain and Opposite Effects from Shallow and Deep Clouds In Climate Science for Serving Society: Research, Modeling and Prediction Priorities, DOI:10.1007/978-94-007-6692-1_5. Levy II, Hiram, Larry W Horowitz, M Daniel Schwarzkopf, Yi Ming, J-C Golaz, Vaishali Naik, and V Ramaswamy, May 2013: The Roles of Aerosol Direct and Indirect Effects in Past and Future Climate Change. Journal of Geophysical Research, 118, DOI:10.1002/jgrd.50192. Golaz, J-C, Larry W Horowitz, and Hiram Levy II, May 2013: Cloud tuning in a coupled climate model: impact on 20th century warming. Geophysical Research Letters, 40(10), DOI:10.1002/grl.50232. Tsushima, Y, and Syukuro Manabe, May 2013: Assessment of radiative feedback in climate models using satellite observations of annual flux variation. Proceedings of the National Academy of Sciences, 110(19), DOI:10.1073/pnas.1216174110. Zhang, Rong, Thomas L Delworth, R Sutton, D Hodson, Keith W Dixon, Isaac M Held, Y Kushnir, D Marshall, Yi Ming, Rym Msadek, J Robson, Anthony Rosati, Mingfang Ting, and Gabriel A Vecchi, April 2013: Have Aerosols Caused the Observed Atlantic Multidecadal Variability? Journal of the Atmospheric Sciences, 70(4), DOI:10.1175/JAS-D-12-0331.1. Rugenstein, M, Michael Winton, Ronald J Stouffer, Stephen M Griffies, and Robert W Hallberg, January 2013: Northern high latitude heat budget decomposition and transient warming. Journal of Climate, 26(2), DOI:10.1175/JCLI-D-11-00695.1.